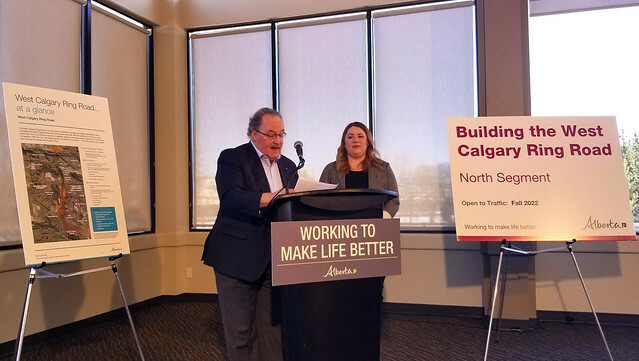 Transportation Minister Brian Mason and Calgary-Bow MLA Deborah Drever announce contracts are in place to begin West Calgary Ring Road construction. The 11-kilometre project is divided into three segments: the south one that connects with the Southwest Calgary Ring Road, the north one that meets the Trans-Canada Highway and a new bridge across the Bow River. The north segment, running between Old Banff Coach Road and the Trans-Canada Highway, will be constructed by EllisDon. The West Bow River Bridge twinning project will be built by Flatiron and AECON. Between now and 2022, the north segment of the West Calgary Ring Road will support 2,393 jobs, while the West Bow River Bridge will support 300 jobs. The Request for Qualifications for the south segment of the West Calgary Ring Road, between Highway 8 and Old Banff Coach Road, will be issued in the coming days. A contractor is expected to be in place for the 2020 construction season. The West Calgary Ring Road will be open during fall 2022, one year following the expected completion of the Southwest Calgary Ring Road project. When complete, the entire Calgary Ring Road will provide travellers with 101 kilometres of free-flow travel. Jean-Louis Sevranckx, president and CEO, Aecon Group Inc.